Fitness blogger and mother of two, Sia Cooper, says the reality is that no mother can win when it comes to how best to be a parent. Under the Instagram handle, Diary of a Fit Mommy, she's been clapping back at mom shamers who insist that working mothers are bad mothers. In fact, she says she's been called a bad mother for a lot of reasons — most of which pertain to her work as a fitness blogger. "If I had a nickel for every time I’ve been called a 'bad mom,' I would be soooo rich!" 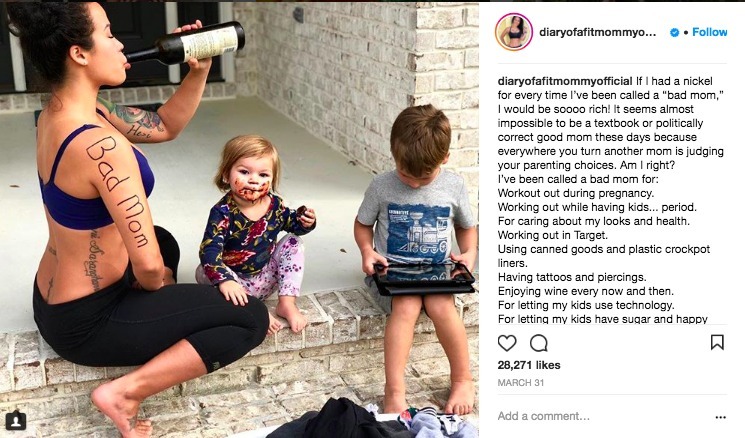 she captioned one photo on Instagram, in which she and her two children are sitting on the steps outside their home — she's drinking a bottle of wine while one kid has a face covered in chocolate and the other taps away on an iPad. "It seems almost impossible to be a textbook or politically correct good mom these days because everywhere you turn another mom is judging your parenting choices. Am I right?" She says she's been called a bad mom for working out out during pregnancy, working out while having kids, caring about her looks and health, working out in Target, using canned goods and plastic crockpot liners, having tattoos and piercings, enjoying wine every now and then, letting her kids use technology, letting her kids have sugar and happy meals occasionally, not “covering up” around he kids, running a full-time business from home, co-sleeping with her kids, collecting sports cars and motorcycles (having a hobby), taking time for herself and for having abs. "I’ve learned that the true 'bad moms' out there are the ones who constantly tear other moms down by judging them," she continued in her viral post that, at the time of writing this, has accumulated 28,271 likes and countless comment. "Those moms are the ones who are truly insecure and have strong feelings of inadequacy because why else would they do that? Misery loves company. There’s no one right way to parent or to be a mom. We all are running in the same race and doing the best that we can. Motherhood is not a one-size-fits-all — what works for one family may not work for the next. So who are we to judge another mom’s choices or reasoning?" It's not the first time Cooper's posts have gone viral either. She went viral before for working out during pregnancy, told that her baby was "going to die and get shaken up in the womb" or that it would have "brain damage." She was also told that her six-pack during pregnancy was going to "choke [her] baby." And then she went viral for the time she "filmed a fun and playful workout video while shopping at Target." When SELF's Instagram account regrammed Cooper's video, the backlash was harsh. While some people applauded Cooper's creativity, negative comments piled up on both SELF and Cooper's accounts, and various news sites picked up the story of the mom who got shamed for exercising in Target. The mom shamers suggested that Cooper find a gym, they insulted her form and called her "obsessive" and "a crazy person," and some even recommended that she take Xanax. Cooper told SELF that her intent wasn't to rile people up; rahter, she just wanted to make a creative post showing her 635,000 followers at the time that it's possible to work out in unexpected places. 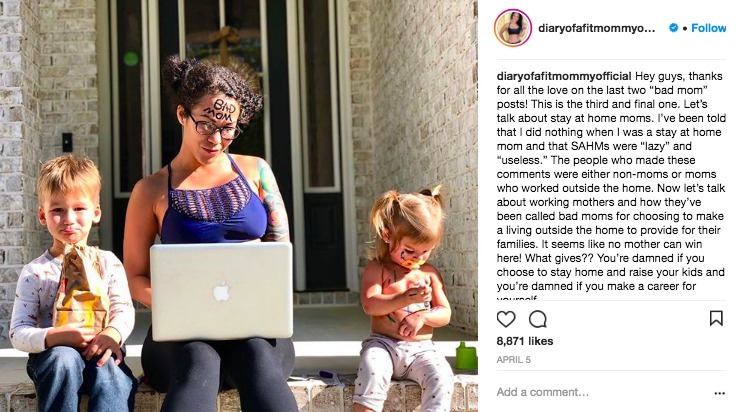 This time, her "bad mom" post resonated so well with her followers, in fact, she posted a second "bad mom" photo on Instagram thanking them for the comments, messages and likes she'd received. "Can I just take a minute to say WOW! The 'bad mom' post that I made last week went VIRAL and stirred up so many conversations around mom-shaming and judgement against moms altogether," she wrote on another photo of her and her two children sitting on the same steps. 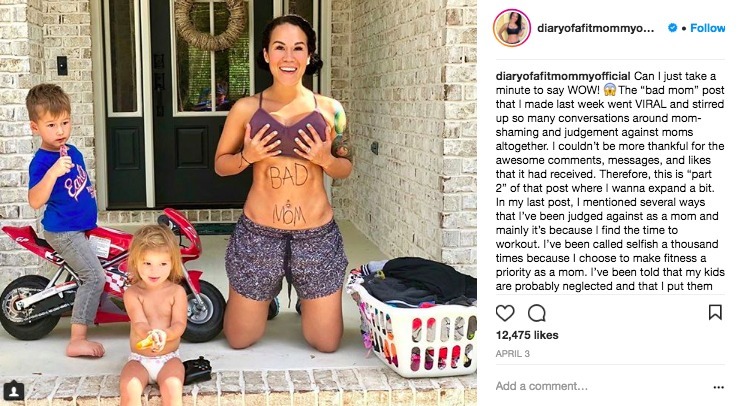 This time, the words 'bad mom' were written on her abs with marker and her two children were playing next to her and a basket of laundry. "I couldn’t be more thankful for the awesome comments, messages, and likes that it had received. Therefore, this is 'part 2' of that post where I wanna expand a bit." She notes that she'd mentioned several ways that she's been judged as a mother – largely because she makes time to work out and prioritize her fitness. She says that she's been told time and time again that her children are likely neglected and that she probably puts them off on a nanny. But she says that the hateful comments normally come from other moms who cannot or will not put forth the same efforts. "My point is?" she asks. "You can’t please everyone and y’all... other moms are the WORST! You’d think that moms would support one another instead of tearing each other apart. It seems like you’re damned if you do, damned if you don’t. If another mom or a person in general wants to call ME a 'bad mom' — vain, selfish, whatever – for putting my health first and for 'having abs' then so be it! I encourage you all to take what you’ve been called a bad mom for and wear it proud. Own it! To the haters, you can kiss my abs. Being a mom isn’t easy and there is no wrong way to parent IF your kids are loved, healthy, and being taken care of. Am I right?" She also posted a third and final "bad mom" photo to talk about stay-at-home moms, too. She says that, when she's not being told that she needs to take a Xanax and chill out, she's told that she's lazy. She's had "so many comments" accusing her of doing nothing, despite her working like crazy and running a $500,000-a-year business that's allowed her husband to retire. Running a successful fitness blog in a saturated market is no easy feat, but Cooper has earned herself one million followers as a NASM-certified personal trainer, as well as the creator of the Strong Body Guide, a 12-week workout with meal plans and prenatal plans. "I’ve been told that I did nothing when I was a stay at home mom and that SAHMs were 'lazy' and 'useless," she wrote. "The people who made these comments were either non-moms or moms who worked outside the home. Now let’s talk about working mothers and how they’ve been called bad moms for choosing to make a living outside the home to provide for their families. It seems like no mother can win here! What gives?? You’re damned if you choose to stay home and raise your kids and you’re damned if you make a career for yourself." Cooper says that she's had so many comments stating that she "[sits] around all day and do nothing." But how she chooses to provide income for her family is none of anyone's business, she says. "If you choose to work 40+ hours outside the home, you go girl!," she writes. "If you choose to forgo a career to raise your children full time — hell yes! More power to both types of mamas because BOTH work so hard in different ways yet they both are constantly judged. WHY?? Why is there this stupid idea of what a mom should be, should do, and should look like. This is how society is so screwed up." She left off her trio of viral Instagram photos by saluting the "mamas who are providing for their families either by offering their services or by bringing home funds." She says SAHMs are just as valuable as career moms and vice versa. "Keep on being a 'bad mom,'" she writes.